Sportaid offers a full line of Mobility Lift Chairs to meet your accessibility as well as safety needs. Designed to maximize both comfort and support, these lift chairs can give you the mobility required to perform your routine tasks. With these ergonomically designed chairs, you can fluidly change from the sitting to standing position. Additionally, with their reclining mechanism, you can lie down to rest or to read your favorite book. Choose the Invacare 3-Position Recliner or any of the Pride Classic Collection Lift Chairs and enjoy your freedom. Browse through our internationally renowned collection of Mobility Lift Chairs below or feel free to call 1-800-743-7203 for help. You'll be glad you did! Select from the top manufacturers and save big with Sportaid.com's everyday low prices. Save up to 27% on Mobility Lift Chairs at Sportaid right now! At Sportaid.com, the Mobility Lift Chairs category is divided into two sub-categories, Resident Mobility Power Reclining Chairs and Pride Mobility Lift Chair Recliners. Whether two-position, three-position, or infinite position chairs suit your needs, Sportaid has perfect lift chair for you based on your body type: petite, small, medium, large, or extra large. Deluxe three-position recliners are loaded with features and designed with ergonomics in mind. Pride Lift Chairs are the brand of choice according to consumers. Browse the Pride Elegance Collection, Heritage Collection, Classic Collection, and Specialty Collection to find the right lift chair for your specific needs. Two Position Lift Chairs — Between two positions, straight and a slight recline of approximately 45 degrees, two-position lift chairs let you rest peacefully anywhere in between. These lift chair recliners provide comfort whether you are reading, watching TV, using the home computer, or just sitting back to relax. Three Position Lift Chairs — The full range of motion with three position lift chairs is from a full upright position to a nearly full reclining position. With the ability to come to rest anywhere along the way, a slight recline is best for reading and napping. Three-position lift chairs can recline further than two-position lift chairs. 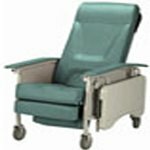 Infinite Position Lift Chairs — For a full reclining position, you will really enjoy the versatility provided by infinite postion lift chairs. With dual motors, one for the back and one for the legs, an infinite number of chair positions are possible. Whether you are a new customer or someone who has been with us for a while, we guarantee satisfaction. After over 25 years in the business helping people find the right Mobility Lift Chairs at the lowest prices, we continue to lead the industry! We carry an impressive selection of wheelchair cushions, wheelchair parts, and wheelchair accessories. We are capable of beating any competitor's advertised price, just call! Our customer service staff has over 50 years of experience, plus over 90 years of combined wheelchair use experience. We look forward to working with you!